Last night I made it out to Mavors as part of the WinterDine Festival, as like anything, it had its ups and downs. 1) They received a nice make over semi-recently. 2) One of our web development clients was asked to be involved in the change over helping critique service and the menu. Mavor's only had one option so there wasn't any selection decisions. First up, similarly to Globe World Flavours was a couple pieces of bread with butter which is always a nice start. The bread was great, but unlike Globe World Flavours, the butter wasn't frozen. It was perfect for spreading and made for a good start. Then the starter came, it is called Rustic Elegance. 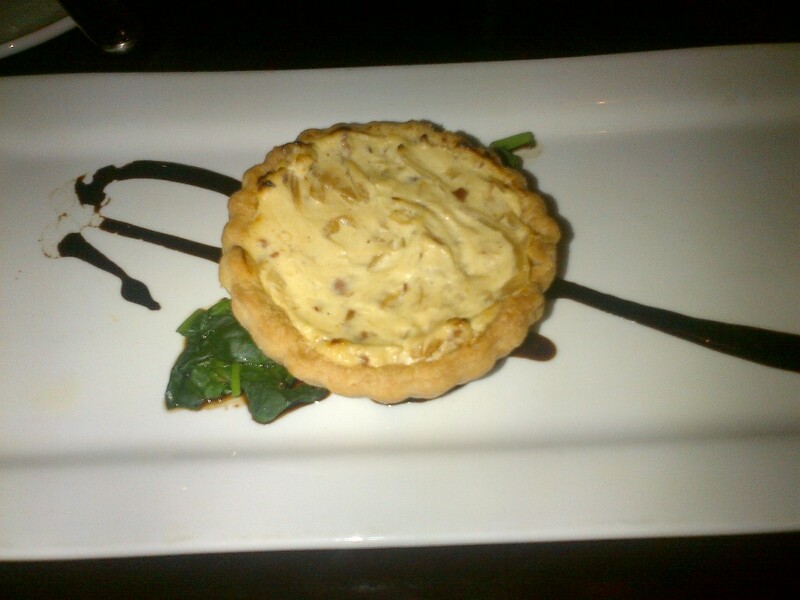 Rustic Elegance is described as "Caramelized onion, bacon and goat cheese tartlet served with a balsamic reduction". I'm not a fan of onion, however the appearance of this looked good. I can't really comment on the taste as I never ate it due to the onion aspect. I did eat bits around the edges and did enjoy that! Next up, the main course. When I had ordered the WinterDine option, I wasn't aware of what I was receiving, however I did inquire as to how many meal selections they had as part of the menu. It was only one. So, when the main course arrived, it looked delicious. There wasn't much of a smell to it, but based on looks alone, it looked great. 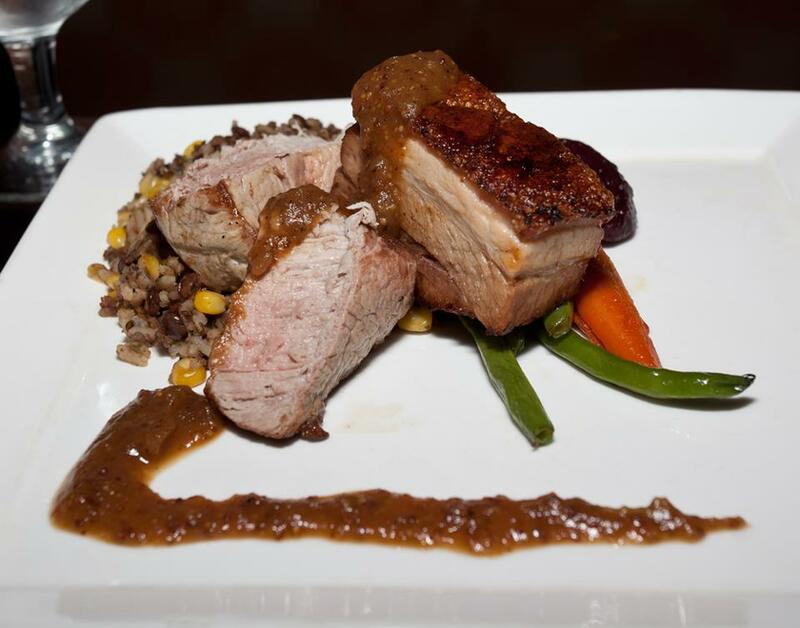 The pork belly and pork tenderloin were both cooked just right. Every bite was just as good as the previous and it was very much so enjoyed. Although the quantity wasn't a large portion, it fit my needs and took care of my hunger as there is more to food then just the amount of food! Onto the chocolate and berries. It kind of threw me off that the dessert was so simple. But the simplicity of it made the difference. Eating the strawberries and combining them with the chocolate was a good mix. 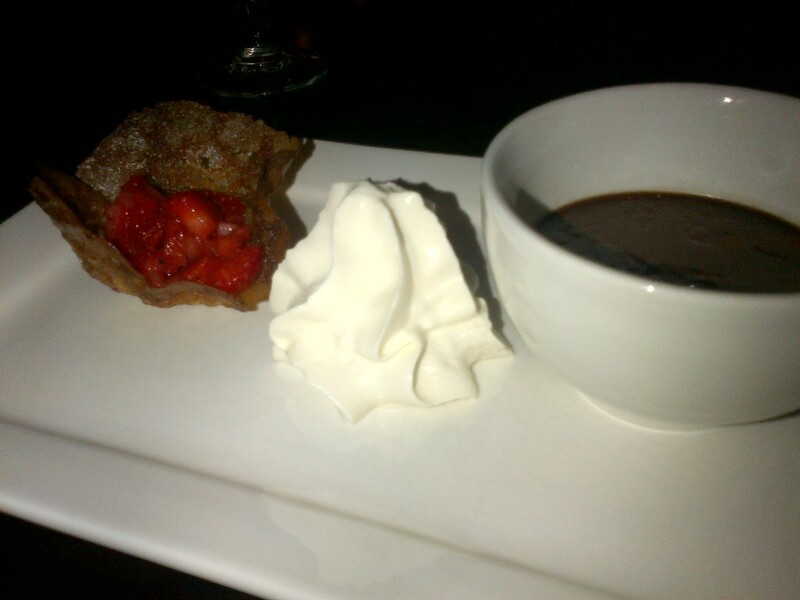 It was a simple dessert with a very much so great taste. So overall, the main course and dessert was great. The appetizer I won't comment further on as Mavor's is at an unfair advantage. The downside of the entire meal was the service. It wasn't lacking, it just wasn't what I was expecting. With all the other restaurants, I was asked how everything was multiple times. At Mavor's, I wasn't asked nearly as much and I found my glass being empty multiple times. Had the layout of the restaurant have been different, the server may have been coming around more often so I could have nabbed her and asked for a glass of water, but not in this case. While I don't blame the server, I kind of got the impression they may have been understaffed. All in all, for the price I paid, it was well worth it.